Happy Memorial Day!! Hope you all have great plans to get outside and have a little summertime fun. Today is the day that most consider to be the start of the summer/grilling season. But, please take a moment today to think about all the men and women that have served our country! This is of course why we really celebrate Memorial Day. Today's recipe is a great layered bar cookie that seems almost too good to be true. This would be the perfect ending for all your Memorial Day cookouts. 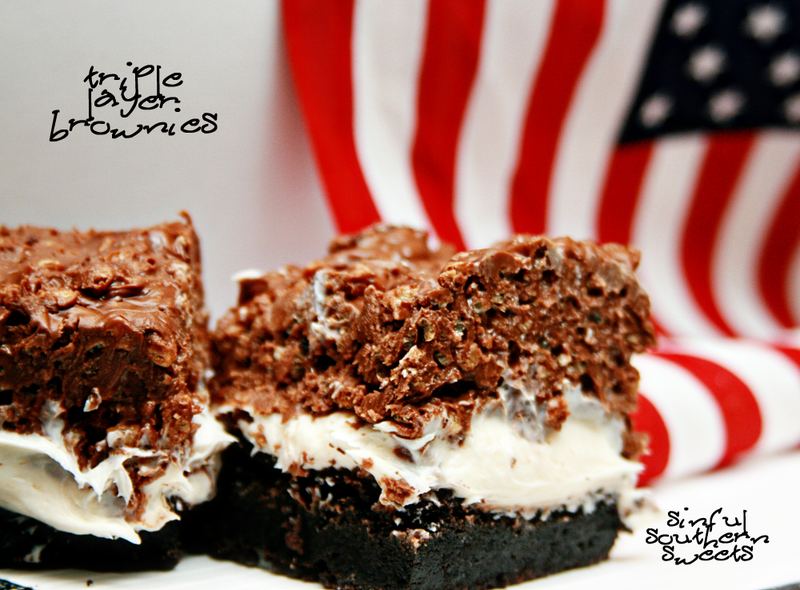 The layers of this treat consist of a brownie layer, a cream cheese frosting layer, and a Rice Krispie/Peanut Butter/Chocolate layer. Need I say more?!?! Even better, this is quick to throw together since it is made from packaged convenience foods. No need to make homemade brownies and icing. 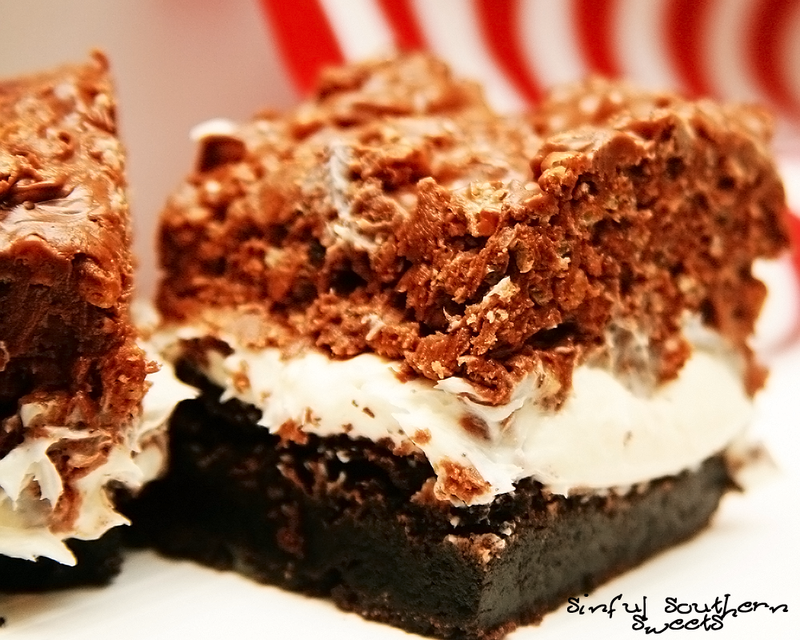 Just grab a box of brownie mix and a tub of cream cheese icing. 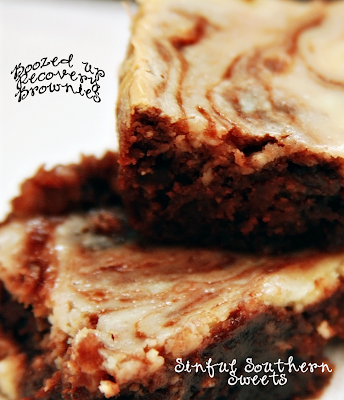 The flavors of this decadent treat are so good, no one will know you took a few shortcuts. The best part...you can actually sit back and enjoy relaxing today instead of slaving over dessert. Have a great Memorial Day! Enjoy! 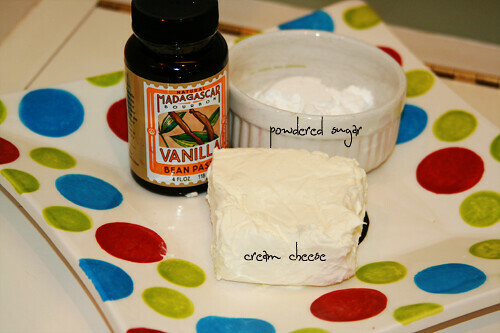 Prepare and bake brownie mix according to package directions, using a greased 13-in. x 9-in. 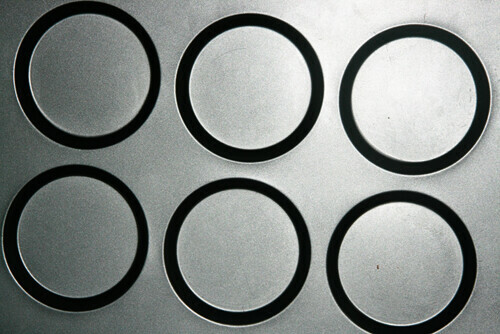 baking pan. Cool on a wire rack. In a large saucepan, combine chocolate chips and peanut butter. Cook over low heat for 4-5 minutes or until blended, stirring occasionally. Stir in cereal; set aside. 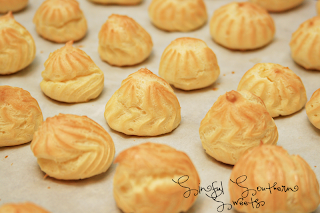 Cream puff shells (also known as choux), Pastry cream and caramel. I have always wanted to make cream puffs, and this was my chance. Well, my chance without too much guilt, since it was my challenge of the month:) I thought they were amazingly simple. Now, you should know, if you decide to make this, you can make the choux or cream puff shells a day in advance and freeze them. But, once the Piece Montee is assembled, it needs to be eaten that day. Preferably within a few hours. Cream puffs do not improve with flavor. Just to give you an idea of what to look for, here was my choux after piping it onto the baking sheets. My point in showing you this is that its not all that tall. 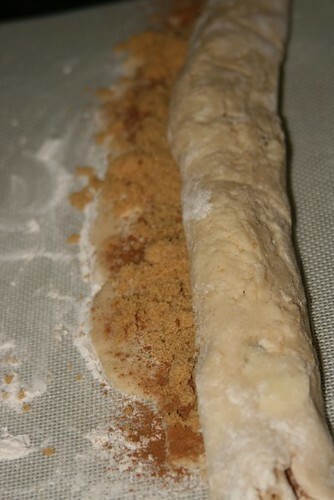 The "puffing" occurs during the baking time. 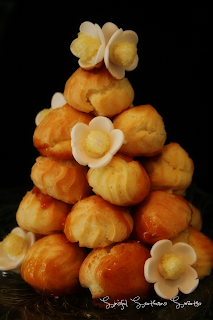 This tower of cream puffs known as a Piece Montee or Croquembouche is actually a traditional French wedding cake. I like the idea of this. Not so much frosting to mess up while decorating. I chose to decorate my Piece Montée with handmade gumpaste flowers. This was my first attempt with gumpaste, but I found it quite easy to make the flowers. 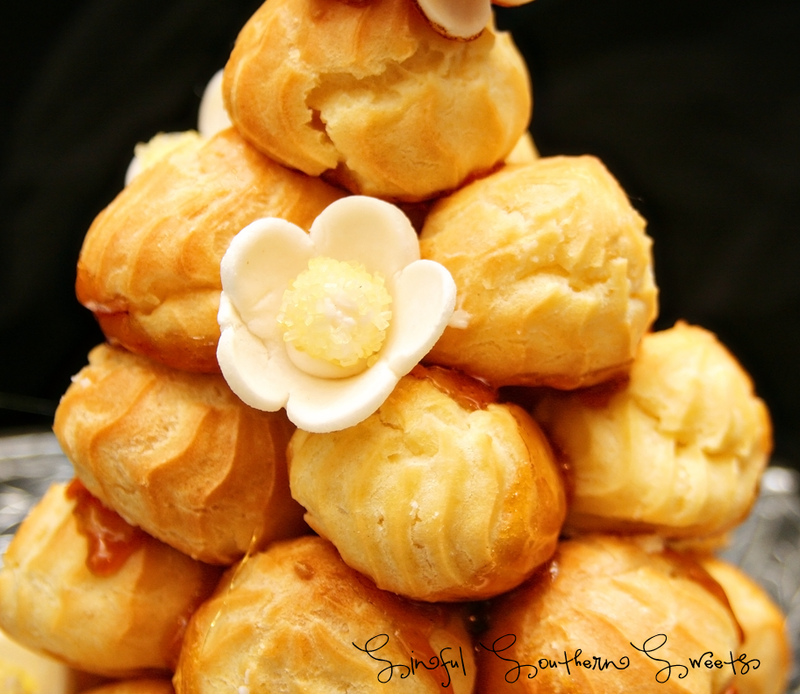 The filling on the cream puffs is a traditional french pastry cream also known as Vanilla Crème Patissiere. I used a Wilton Bismark Tip #230. This will make your life much easier in the filling process, as the tip punctures the cream puff and fills, all at the same step. My honest opinion on the filing is that it tastes like vanilla pudding, but oh so good vanilla pudding. Like good, homemade southern vanilla pudding (I suppose you could call it a custard) that should be used to make the perfect banana pudding. Though the Piece Montee requires several steps. None of the steps are overly complicated or require ingredients that cannot be easily obtained at your local grocery store. I highly recommend this for any special occasion. And I can absolutely see making this at Christmas time and using the cone-shape as a Christmas tree. Now, wouldn't that be cute! Enjoy! You may want to lay out your unfilled, unglazed choux (cream puffs) in a practice design to get a feel for how to assemble the final dessert. For example, if making a conical shape, trace a circle (no bigger than 8 inches) on a piece of parchment to use as a pattern. 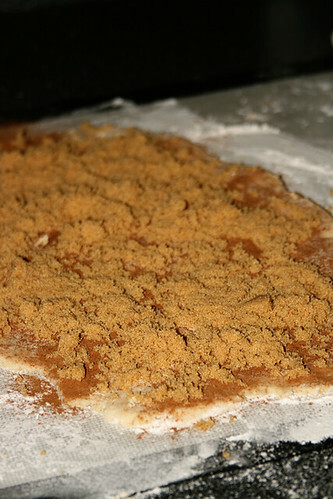 Then take some of the larger choux and assemble them in the circle for the bottom layer. Practice seeing which pieces fit together best. 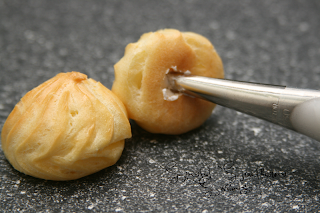 Once you are ready to assemble your piece montée, dip the top of each choux in your glaze (careful it may be still hot! 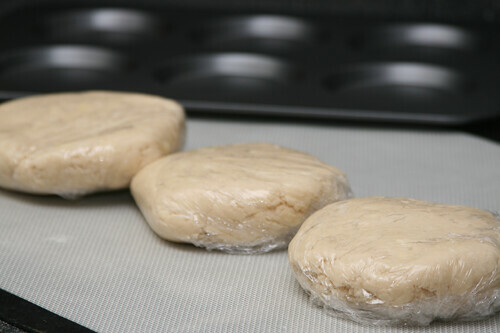 ), and start assembling on your cake board/plate/sheet. Continue dipping and adding choux in levels using the glaze to hold them together as you build up. Decorate as desired. Do you see what I see? Look closely at that little cupcake. Is there something hiding amongst the fluffy golden cake? Yes, yes there is. Do you know what it is??? Well, if you guessed cookie dough, then you are exactly right. (If you missed that one, you need to start reading the titles of my posts a little more closely. LOL! 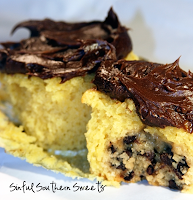 :) Now I realize a cookie dough infiltrated cupcake seems a bit sinful, but hey, that's what we're all about here at Sinful Southern Sweets. Right?!?! Right.. I have been studying this recipe for quite some time. I finally took the plunge. It is every bit as indulgent as you are imagining it to be. Now, Mr. Sweets believes I ruined the cupcakes with the rich chocolate icing. He thinks the icing made them "too sweet." Those of you who have followed my blog for very long know, I do not recognize vile statements such as this. So,don't listen to him. He's an amateur at this whole "sinful" thing. Though, if you're so inclined, I suppose you could leave the icing off. But, you're doing so at your own risk :) Enjoy! 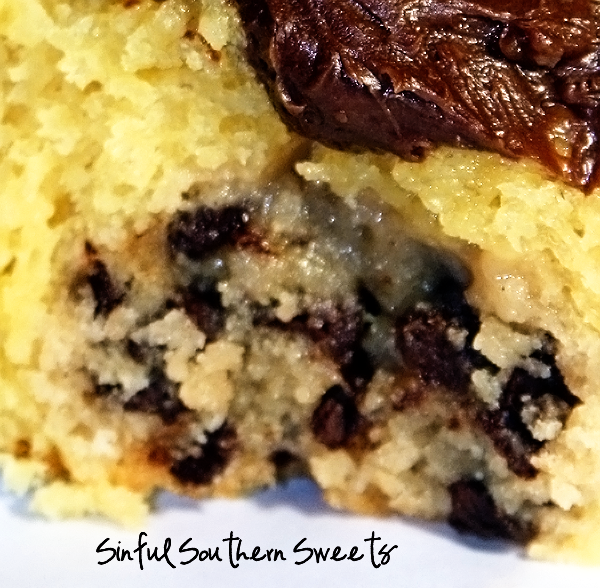 Sift the cocoa with the confectioners' sugar and add to the creamed mixture. 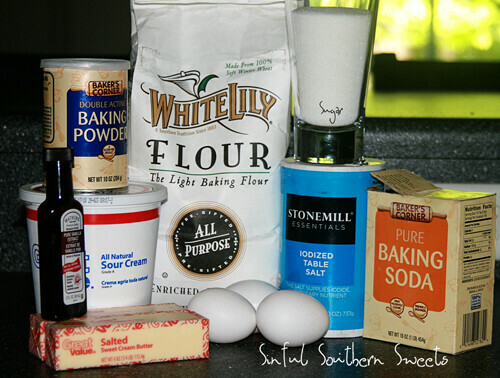 Mix together adding 1 tablespoon at a time of milk to keep mixture smooth. Don't add more than 1/4 cup of milk. Do you know how healthy pomegranate juice is for you? If you don't, then you should. So let me tell you...The Pom Wonderful company has several scientific studies that have been published indicating that pomegranate juice is beneficial for heart health, muscle recovery (after workouts), erectile function and prostate health. So guys, you need to be guzzling this stuff down!! Have it with a pound or two of pecans :) If you'd like to read more about the benefits of pomegranate juice you can read it here. Besides its many health benefits, its seriously good. The fine folks over at POM Wonderful contacted me a while back and offered to send me some pomegranate juice if I would create a new pomegranate containing recipe. I thought and thought about the recipe I would bring to the table. 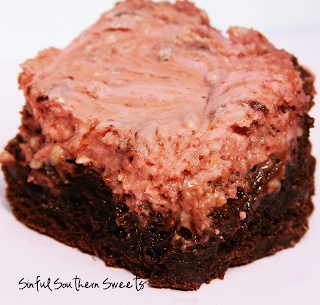 And, then I came up with this......A Pomegranate Cheesecake Brownie. My girls loved the color of this. It was such a pretty pinkish-lavender color, much like the Berry Muffins I made a while back. Doesn't every little girl love anything pink or purple? Even better if its a mix between the two. This dessert was such an indulgent combination of two heavenly desserts. 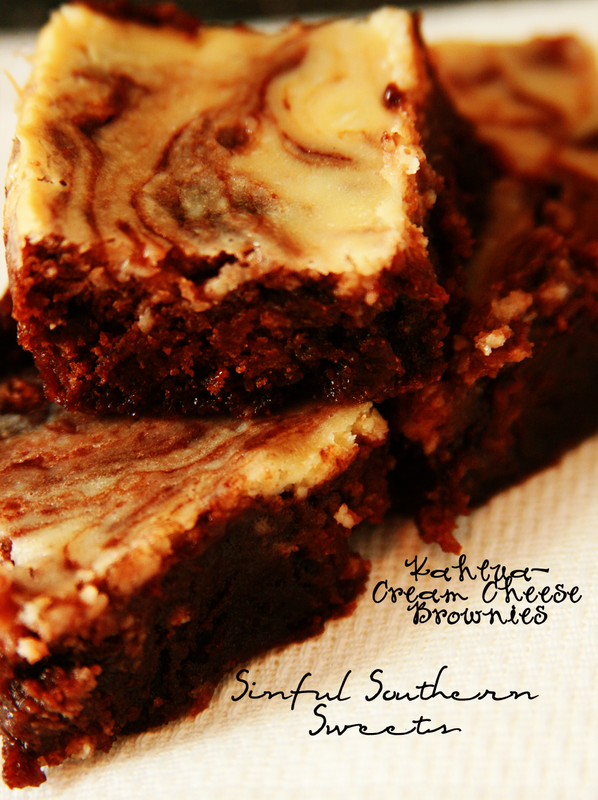 How can you beat a brownie with a cheesecake baked on top?!?! Well...you can't! (But if you do, let me know :) This was so good, my husband even woke me up at 2am going to get a little taste of this sinful sweet. I'm sooo not a nice person when I've just woken up. Sorry, Mr Sweets. So, I recommend serving this early in the day so its all gone before bedtime. Enjoy! Mix all ingredients until just combined. Spread into a foil-lined, greased 9 inch square pan. 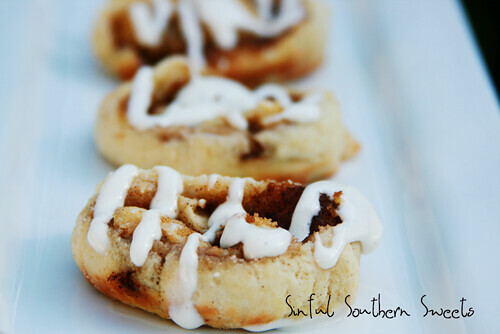 The Cinnamon Chip recipe I'm sharing today was received from my sister in law. Her grandmother makes these every year for Cinco De Mayo. I can remember her talking years ago about how good these were. And she was right!! They are very easy, but really great! 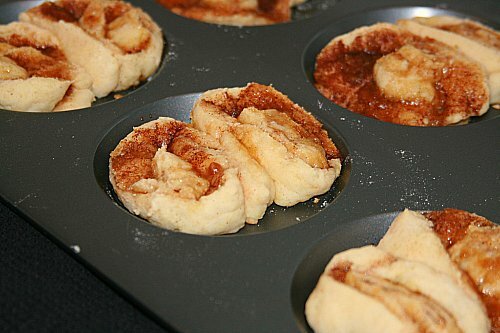 These are perfect for snacking on. 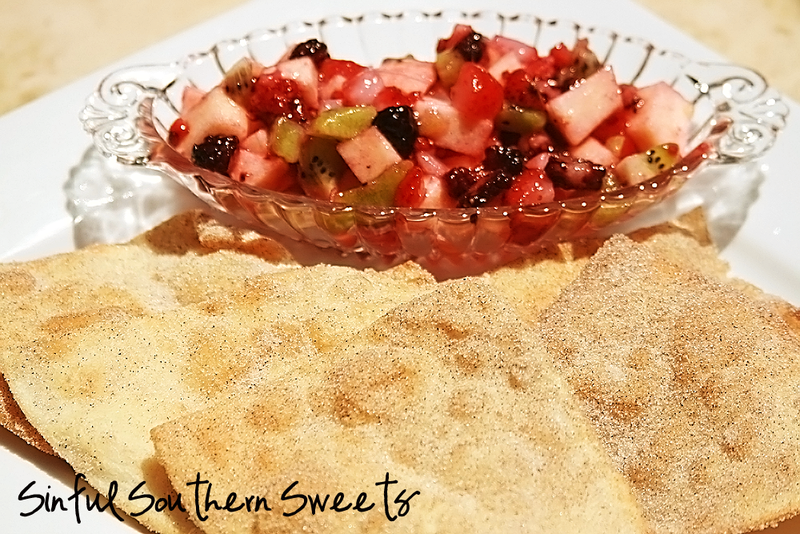 Though you could also drizzle these with honey and top with ice cream for a sopapilla dessert. Today I'm serving them with fruit salsa. 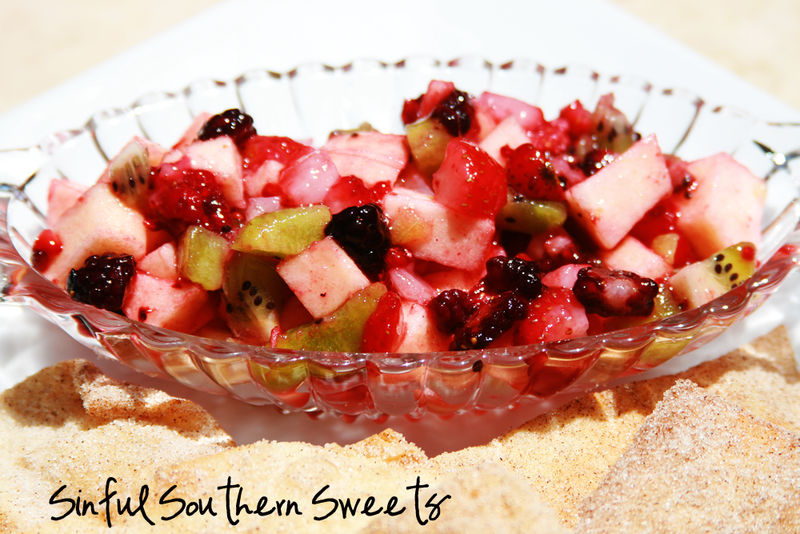 The fruit salsa was something I had first experienced at a party I attended a month or so ago. 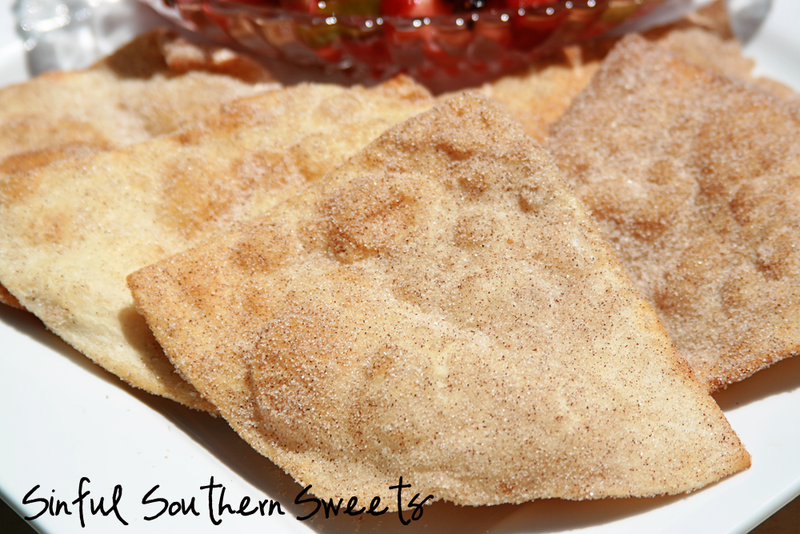 Its light and refreshing and makes the deep fried Cinnamon Chips seem just a touch healthier (if that is indeed even possible). Hope you have a wonderful Cinco De Mayo! Enjoy! 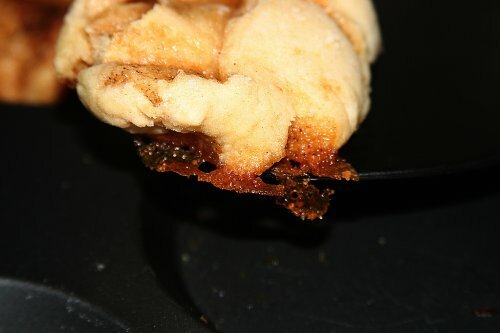 Heat oil in a medium heavy saucepan to 375 degrees F (190 degrees C).Slice flour tortillas into triangles. Carefully place tortilla triangles into the hot oil and fry until puffed and lightly golden brown, 1 or 2 minutes. Drain on paper towels. 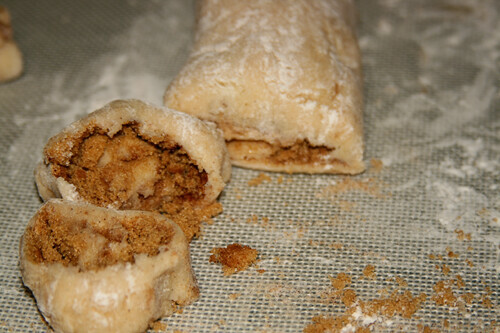 Place white sugar and cinnamon in a large Ziploc plastic bag. While still slightly warm, drop fried tortilla triangles into the bag and shake to coat.